Do you have a bachelor party or a company outing soon? What is more fun then paddling on the water? Up to 7 people can enjoy the dutch waters under Zeebaard’s companion. 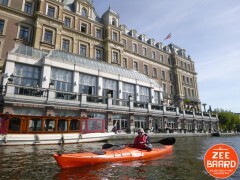 With Zeebaard’s kayak trailer almost all the dutch waters can be reached. Zeebaard’s home is Leiden. 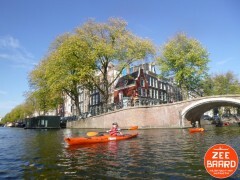 Locations like the dutch lakes, the canals of Leiden, Haarlem, Delft and Amsterdam are paddled frequently. Other well accessible locations are the Biesbosch, ‘Het Twiske’ (north of Amsterdam) and the lakes around Utrecht. Let me know your requirements and we will find a suitable location. The trip will be adjusted to your needs. If you have a preference for a location, let us know. Start at a pub? No problem. Based on your preferences, we are looking for a good entry spot and plan a nice trip. We always take care of safety on the water, weather conditions and other waterway traffic. For all groups who want to paddle. A group of friends, large families, bachelor parties, company outings, etcetera. Costs depends on the amount of people and the length and location of the trip. 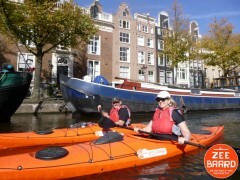 The price is based on €27,50 including VAT for 1.5 to 2 hours paddling per person. Please contact us for a price indication or a free offer. 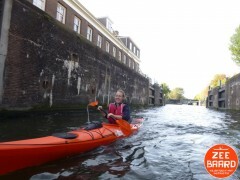 Zeebaard owns 7 kayaks for participants. More people in your group? Let us know and we will try to arrange extra boats and facilities. Zeebaard is well known with the water and everything required to make a nice trip. Zeebaard has all the materials; good boats with comfortable seat. Through the availability of a trailer almost all dutch waters can be reached. There is always a companion who takes care about security and wellness of the participants. Cancel a trip without any charge 3 up to days in advance. A later cancel will be charge because boats and guidance are reserved. When the trip is cancelled through weather conditions, no fee will be charged.